In this edition of the SA parkrun newsletter, we round up the year with a few extra parkruns – don’t miss out! Root 44 shares their planned festivities with us and Bryanston parkrun has your dog’s best interest in mind. We hear from a few parkrunners who share their experiences with us. SA launches the parkrun Show Podcast, don’t miss out! This is an exciting time of the year for parkrunnners because it is possible for us to run a couple of bonus parkruns. There are some parkruns that will be holding Christmas and/or New Year parkruns despite the fact that these holidays do not fall on a Saturday, The decision to stage holiday parkruns is up to each parkrun community and some have opted not to run these extra parkruns. Please look at the link to see which SA parkruns will be hosting extra events. It is always special when a parkrunner reaches the 100 club, black shirt milestone and we are delighted that so many South African parkrunners are joining the club. We would like to single out Thelma Fouche however because she has recently run her 100th parkrun at the age of 80. 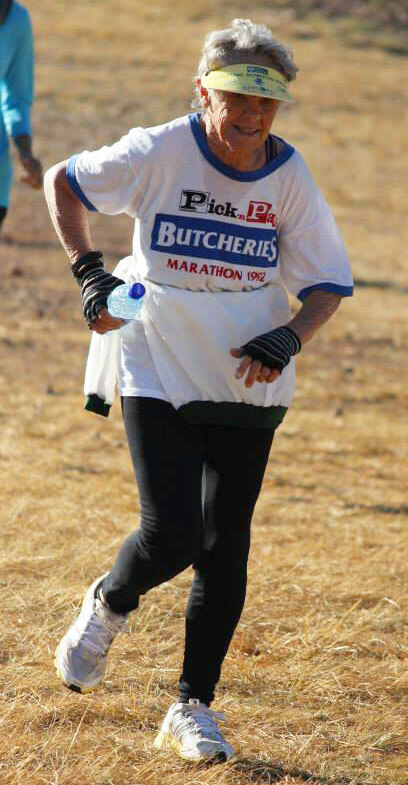 A loyal Roodepoort parkrunner since the very early days, she has also run the Voortrekker Monument parkrun and at Albert’s Farm. We have been informed that Thelma’s trip and tumble at Albert’s Farm would have earned her a 9.75 in the Olympic gymnastics but despite this mishap she still soldiered on bravely to the finish. Congratulations Thelma, and welcome to the club. Lordrick Mathonsi and his team launched their Nkomazi parkrun last Saturday. Run through sugar cane fields bordering the Nkomazi Township this parkrun is close to the borders of Mozambique, Swaziland and the Kruger National Park. There was an enthusiastic crowd of runners at the start including some whose journey to the start had been delayed by a pride of lions on the Lower Sabie road. 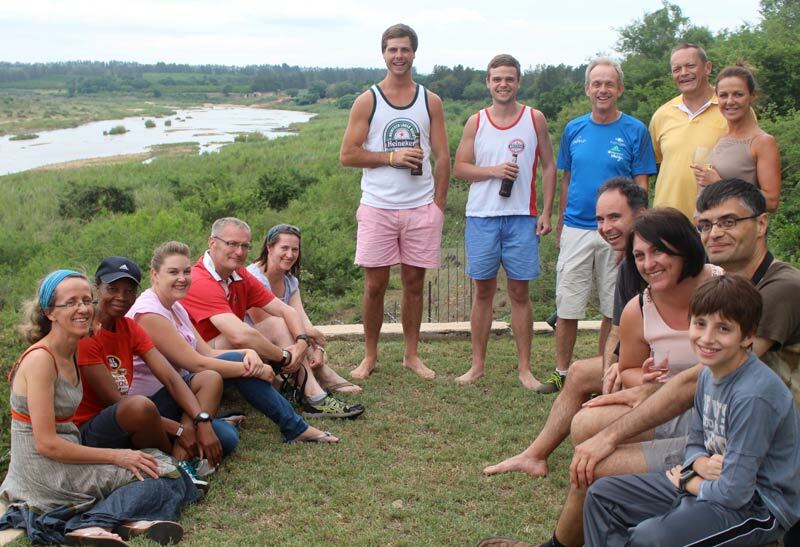 A particularly enthusiastic group of parkrunners at Nkomazi were the parkrun tourists who travel to as many different parkruns as they can. They are seen at many of the new parkrun launches but also at our more remote parkruns scattered all around the country. Some of them have run every South African parkrun and are now attempting to do this for a second time. This is a fascinating challenge and quite lucrative for many local economies! Ever since Rhoda Du Plessis started the Voortrekker Monument parkrun in Pretoria we have been aware that one parkrun was never going to be sufficient for the nation’s capital. The demand escalated despite our launching a parkrun in Laudium. The demand has told us that the” Eastern flank” of Pretoria was badly exposed and so we are delighted that on Saturday we will welcome Botanical Garden parkrun (Pretoria East) to the Pretoria parkrunners. Ilana Wait and her team have measured a beautiful two lap course through the fascinating gardens. The stretch through the Madagascan forest is particularly interesting. We would like to thank the Garden authorities for their invaluable help. The December edition of our Media Partner, Modern Athlete Magazine is available online now! Subscribe to Modern Athlete here. The parkrun show is enthusiastically brought to you by Stefan & Jenna van der Merwe who are also the event directors at the North Beach parkrun in KZN. This week we talk to Bruce Fordyce about how parkrun started in South Africa, his most embarrassing sporting moment and we get to quiz him on his parkrun knowledge. Join Team Vitality – Discovery Vitality’s new running and cycling club. Gear up and join the Team Vitality movement. Get an awesome starter pack which includes a Premium Team Vitality kit, over R1000 in vouchers for race gear and fitness devices, up to 50% cash back on registration fees for some of SA’s best races ,up to 5 000 Vitality points for each event you complete . PLUS the coolest race club experience around. Go to www.discovery.co.za for more information. Root 44 parkrun Annual Christmas Fancy Dress Event! DRESS UP & you could win a prize! I would like to thank all the Root 44 parkrunners, Root 44 Market and Audacia Wine Farm for their continued support of our beautiful parkrun. Thank you to everyone who has volunteered this year. A special thank you to my regular volunteers and especially to my core team for all their help over the last year: Gaenor and Alistair Hartenberg, Kobus Toua, Ilse Langhout, Sarah Shaw, Melinda Morgan and Robyn Scott. Last, but not least to Chris Visser, Run Director, thank you for being at parkrun every single week and taking the reins when I cannot be there. May we all have a fantastic 2015! 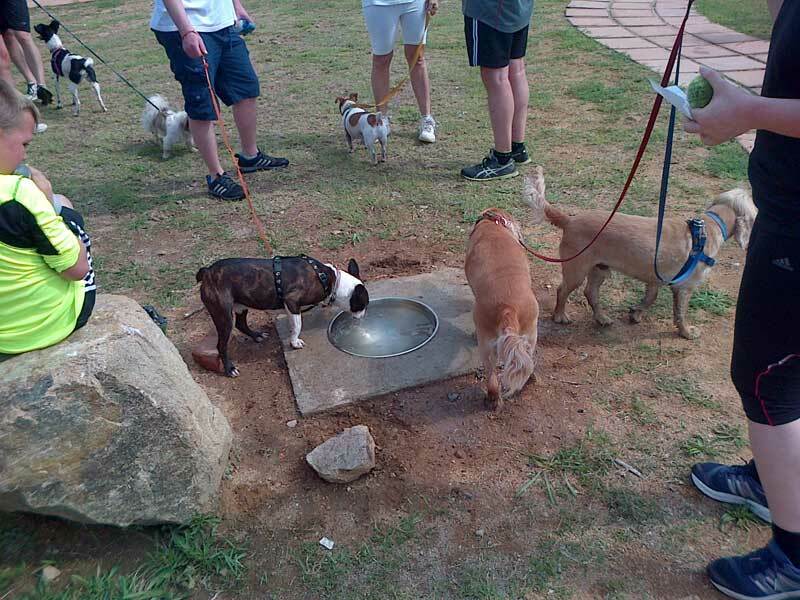 The Bryanston East Community Forum has installed a permanent water bowl for our dog walkers. During the past few weeks, we have experienced blistering hot mornings at parkrun and now your fury-friends can enjoy some well deseved water at the finish! I loved Giselas' mail on Cannibal parkrun in the last newsletter. Such a nice letter, thanks for sharing. I would like to share my parkrun experience as well. February 2014 I was on the Gautrain from Kempton to Sandton and as we passed Modderfontein I saw an advertisement of new developments. I got to work and Googled the area where I came across the Modderfontein parkrun. I then saw there was one closer to home - Ebotse. I registered myself, my husband, my brother, my mom and dad. Then I shared my first results on Facebook where 6 of my friends saw this and registered. It's like spreading a disease... a highly contagious, but not life threatening disease. parkrun has now became a fun, free, family affair. We've done Modderfontein, Delta park and Woodlands. Even after my dad was diagnosed with cancer earlier this year, he still runs parkrun and it makes me so happy when he tries to improve his time. You guys help us be more healthy and active! And then finally... just to say that I absolutely love the competitive nature and the camaraderie you experience at each and every parkrun! I grew up with a love for the outdoors in the Eastern Cape (and not much interest in computer games or TV watching as it became available through the mid-70’s onward). I’ve been something of an admirer from the fringes’ of powerful athletes – especially the endurance marathon runners. I am a great fan of your remarkable running legacy and always wished for more disposable time to get involved. The years pass so quickly and now at 52 those teenage / young adult years are long passed. I’m still overly busy with still too-many irons in the fire, but I have made the decision and have picked up running, which I last left off in army days (1981-2). I have watched many of my friends over the years get out of shape, lose their vitality, and accept the gradual slump into poor health and all the diseases and poor quality living that goes with such loss. Having made the commitment to achieve the red ’50-Club’ parkrun T-shirt, I am running every day before work to build up my strength. I feel rejuvenated and can’t wait for Saturdays to compete against my previous modest PB. I am making progress – I made it into the upper 20’s and now I’m aiming for sub-25 minutes. 10 runs behind me: 40 to go. Thanks for this great athletic initiative. Maybe I’ll get strong enough to set the goal for a marathon. “Wow” says Ray, “I have been involved in events for 27 years all over the world I have managed winners of the New York City Marathon, and 14 winners of the Comrades Marathon as well as 84 Comrades gold medallists and no-one has ever said that to me. I have NEVER seen anything quite like parkrun. I see human beings transformed from being human doings. I see humanity in action. I see people who ARE the difference. I see a massive swell of people who are celebrating, enjoying, loving, and appreciating just being. In this edition of the SA parkrun newsletter, Root 44 parkrun shows off their first 50-Club runners. 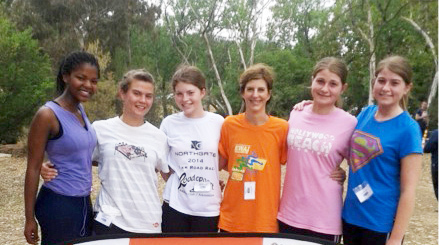 Hear what Co-director of White River parkrun has recently achieved overseas. 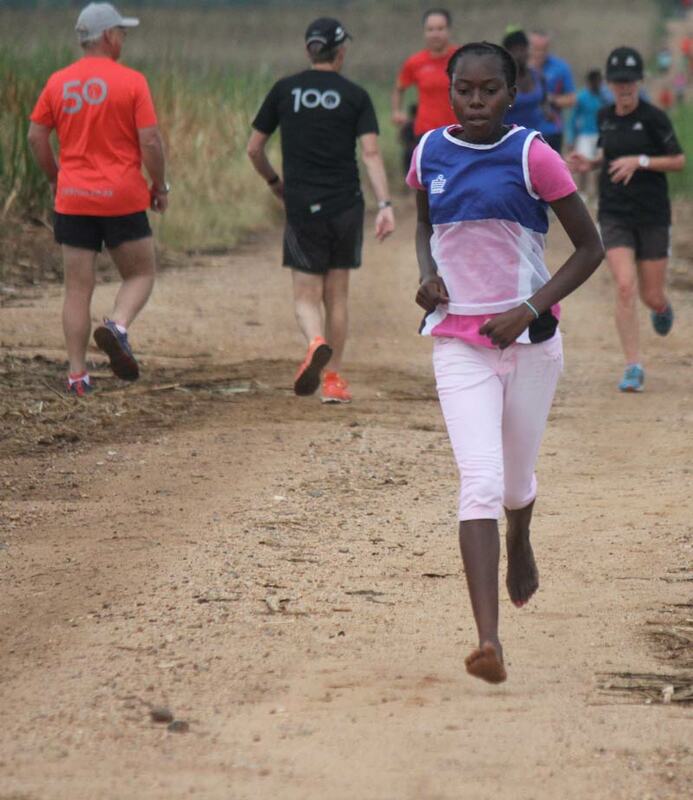 Runners give personal feedback from Johannesburg parkruns as well as Cannibals parkrun in the Drakensberg. With the December holidays upon us we are receiving a number of enquiries about the holiday status of our SA parkruns. Many parkrunners are concerned that we will cancel parkruns at this time. Let us emphasise that we are not cancelling parkruns and in fact at some venues we are adding extra parkruns. In keeping with the practice at some UK parkruns Amanzimtoti, Delta, Potchefstroom, Rondebosch Common, Roodepoort and Modderfontein we will be holding extra parkruns on Christmas Day. In addition Delta, Modderfontein Potchefstroom, Rondebosch Common and Roodepoort parkruns will also hold extra parkruns on New Year’s Day. On this day in Johannesburg it will be possible to run two parkruns as the start times will be staggered to allow parkrunners to travel to another parkrun after they have finished the first parkrun. Please check the homepage websites for start times. The annual migration to South Africa’s holiday venues means that some of our coastal and holiday venue parkruns will see an increase in their numbers. We would like to encourage our upcountry parkrunners to visit other parkruns and experience parkrun at a different venue. As visitors you will be warmly welcomed. Our event Directors and run directors are prepared for the upsurge in numbers but we would just like to encourage our parkrunners to arrive at these venues with plenty of time to find parking. Don’t forget your barcodes. We also expect a surge in numbers at all our parkrun venues in January when parkrunners return from holiday feeling guilty about overdoing things on holiday and driven by New Year’s resolutions. This Saturday we will start another rural community parkrun in the sugarcane fields of Nkomazi close to Komatipoort and the borders of Mozambique and Swaziland. We are delighted to welcome Lordrick Maphonsi and his team to the parkrun family. Many of you will know that parkrun SA was nominated for an SA Sports Award. This is a wonderful accolade for a community recreational event that is just 3 years old. We would like to congratulate and thank all our regional and event directors, all our parkrunners, our sponsors and most importantly all our wonderful volunteers. This nomination honours us all. Thank you. It may already December, but it’s not too late to Get to Gold. Read our five easy tips and remember, if you reach Gold Vitality status this year, you will stay on Gold for the whole of 2015, and you’ll enjoy all the great benefits that come along with it. This season, the legend of adidas Supernova will be told through a design specifically built for the unique fit, look and feel of women. The new adidas Supernova Glide BOOST™ will keep the award-winning* BOOST™ midsole designed to ensure every run feels like gliding. This season, the women’s Supernova Glide BOOST upper receives a facelift that delivers a sleek, slimming and stylish appearance while maintaining the performance integrity of Supernova. To accomplish this, the technical features have been reconstructed throughout the shoe to provide a smoother silhouette that’s more flattering to the female foot. BOOST foam cushioning provides the highest Energy Return in the industry using thousands of durable Energy capsules that maintain their soft cushioning, season after season, so every run with BOOST feels like the first. BOOST cushioning also remains consistently responsive in any weather condition while standard EVA expands and hardens in varying temperatures. And, along with performing in any temperature, Supernova Glide BOOST delivers a neutral ride that’s suited for any runner. Whether you’re heading out for your first leisurely jog or lacing up to leave your mark on race day. - Adaptive upper provides a unique fit for varying foot shapes. Techfit on the women’s version and Stretch Mesh on the men’s. 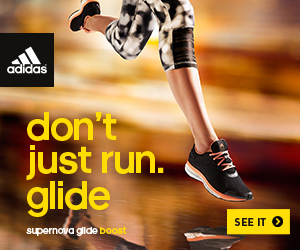 The new Supernova Glide BOOST is available at adidas Sport Performance stores. View the footwear at here. On completion of your 50, 100 or 250th parkrun, you will be sent an email asking you to "visit your profile page." Click on the link and once the page opens, select the menu "club progress." confirm your home parkrun - this is the parkrun that your T-shirt will be sent to for collection. Lastly, select the size of T-shirt that your require. T-shirts are not automatically sent once you have run a milestone parkrun, therefore it is important to claim your T-shirt as mentioned. Root 44 parkrun has been having a great month so far! We have broken another attendance record with 741 happy parkrunners (not so sure how happy the scanning table was)! Root 44 has seen some more parkrunner going ‘RED’ and juniors entering Club-10 and even parkrunners supporting the ‘Show your Mo’ campaign of the Root 44 Market. Our first home run lady to run her 50th parkrun is Hanlie Strydom! Hanlie is one of those who always finishes with a smile a thank you for the volunteers. Next to run her 50th is Miss Mia Doyle! Keeping it in the family, she is the third Doyle to go RED. Mia always has hug for the regular volunteers, helps out where she can and had become a role model for the younger kids. We have watched Mia over the last 18 months grow from a girl into a lovely young lady. Well done Hanlie and Mia! Winelands Marathon Saturday saw our attendance drop quite a bit, but that pleased us as we knew many of our parkrunners had entered (and a lot for the first time) one of the road race distances. Our Run Director was also advertising parkrun and encouraging the runners, as they ran past Root 44, over our loud-hailer! That parkrun event was great fun as it was run in the rain and hail and the small group got nice and muddy. Even Adidas surprised us with visit! Root 44 parkrun Annual Christmas Event! 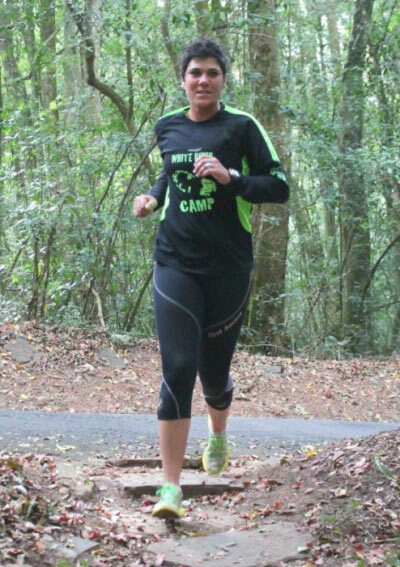 White River parkrun is very proud of our Co-Event director, Linda Roets van Staden. Last week Linda and a group of fellow kick boxers left for Prague where they competed at the 2014 World Championships. The team fared well with a large number of podiums including White rivers own winning her weight category and becoming the 2014 World Champion. Linda is fairly used to world championship events as she has represented South Africa in cross country (1999 & 2000) and athletics (2000 - she boasts a 9:23.5 3000m on the track) on the world stage as a junior. Her boot-camp group are regular volunteers at parkrun. I was recently invited by friends to join them for a week of hiking in the Drakensberg. I can’t remember which opportunity I jumped at first, the hiking or the Cannibals cave parkrun on Saturday 1st November. Only after I had paid for my accommodation did I think to look at the results from Cannibals…… that’s when I started thinking that I had made a serious mistake ;-p considering that this run is in the mountains! I’m used to running in a field of at least 300 participants as I alternate between Bryanston, Lonehill and Woodlands. Suddenly I would be taking part in a group of possibly only 30, all of them being locals and obviously very used to running hills. I still walk most of the hills on any parkrun! I had a week of some very tough hiking and my knees and legs were feeling rather tender however I had committed to doing the Cannibals parkrun so I took a drive on Friday to meet the awesome Lizzy at Cannibals and to familiarise myself with the route. Lizzy quickly had me feeling much more comfortable. While we were chatting a car drove past and then reversed back to enquire about the parkrun as Lizzy flies the parkrun flag outside her store permanently. The young couple was also spending some time hiking and were excited the see that there was a parkrun. They said they would try and make it as they were staying quite a bit further away. Saturday morning was cool and wet after some overnight rain. Unfortunately the spectacular Amphitheatre was not visible. I received a very warm welcome and Lizzy introduced me to the other runners. The bulk of the runners are under the age of 15 and not many of the others are over the age of 20. As there was a small number of volunteers, Lizzy asked the fastest runner to take the cone with to the halfway mark and then also asked the last person (I volunteered my services ) to collect the cone on the way back. I had explained that I intended walking the route. At 8am when the start was signalled – the runners took off at a sprint. I could not believe my eyes! I have never seen such a fast start. Two young ladies, Nosipo and Nikiwe very kindly decided to keep me company along the way. I wished that I had a camera with me. The children started the run in an assortment of shoes and due to the weather several layers of clothing. I found shoes on the side of the road, shoes on the white line in the middle of the road, the odd jersey in the road etc. They would simply leave them there and then collect them on the way back to the finish. On the funny side, I had my best ranking ever and I was also first in my age group. I had a wonderful time and at the end there were several requests for photographs with much chatter and laughter. 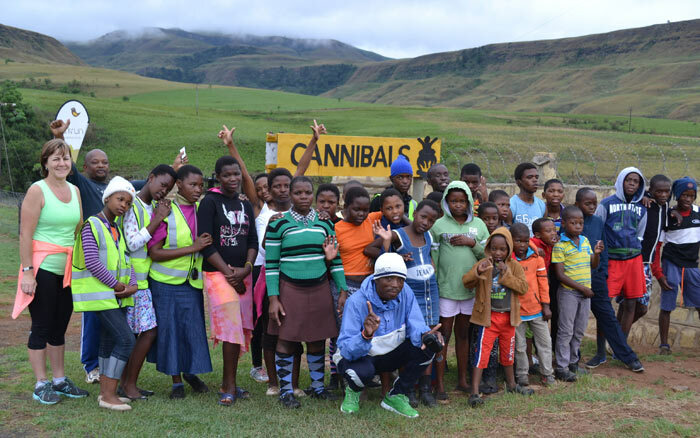 One of the guys said that he knows there are about 800 entrants at every parkrun in Johannesburg and suggested that I bring all of them along to take part at Cannibals Cave. What an amazing group of people and hats off to Lizzy for all the wonderful work she does in the community. I would encourage anyone visiting the area to make a special point of doing the Cannibals Cave parkrun. I am a passionate runner and teacher of 21 years. I, too, would like to provide some positive feedback in response to the article Delta Park Trampled in the Randburg Sun week ending 31 October. It has been giving me great pleasure to see the growing number of teenagers joining in the Saturday morning parkruns. Being a mom of two teenagers myself, I understand the sacrifice and the amount of encouragement one needs to give up a Saturday morning ‘lie in’. As a Maths teacher, it has concerned me how ‘gaming’ and the likes there of have demanded the attention of our future generation. How ‘screen time’ has become a growing obsession. I have actively been encouraging and providing incentives to get my grade 11 learners out there running. Now that they are enjoying these park runs, they are more inclined to want to keep this beautiful park clean. I am encouraged that Delta parkrunners have spent Saturday mornings picking up litter. So instead of complaining about the park being used on a Saturday morning, I would like to applaud the Delta park running team and say thank you for this valuable, healthy and safe service you provide for our community and in particular our future generation.